I am looking for some suggestions for the sound in my 2004 non-Bose 6 S wagon. I am not (nor will I unless it fits under the seat) running a sub-woofer. I am using the stock head unit and was curious if anyone has replaced the OEM speakers with aftermarket and heard a significant improvement. I would like more everything really but I know I wont get it so, perhaps better definition (especially with speech) and a little something better on the lower end. Everything I have searched on the forum is either Bose replacement or 5+ years old. If I could spend less than $200 on the 4 door speakers I would be pleased. I realize it all starts with the head unit and with that there I may be significantly tying my hands (or plugging my ears) by not changing it but this is where I am. I have the Bose in my wagon. It has a spare tire sub. You might be able to adapt that to your non Bose system. The whole thing fits under the cargo floor. Should be able to find one at a junk yard or online. Has anyone installed a Bose spare tire sub into a vehicle not equipped with a Bose system? I don't know much about the non Bose system but I'm sure most aftermarket speakers will sound good assuming that the system is 4ohm vs 2ohm. I was going with go with Rockville Audio (might try again). 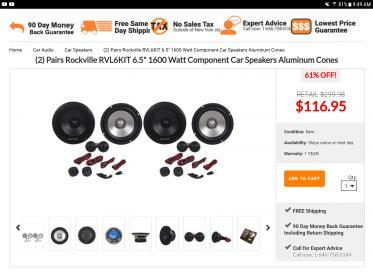 You can get 2 sets (4 speakers) of components for $116. I had them in my 6 for a little bit but my front drivers side kept leaking water in and shorting out the crossovers. Sound great for what they are and won't break the bank. Would need to make some spacers and adaptors but with some mild woodworking, it would be easy. As far as a sub goes, one could get a powered sub to fit under the seat or make a fiberglass or layered MDF enclosure to fit into the spare tire and more then likely end up with better sound than the Bose speaker/amp combo that goes there.